Peruvian equities have been facing a number of headwinds in 2017. After a strong start to the year which saw the iShares MSCI All Peru Capped ETF (EPU) climb 11% by early February, the ETF has lost a lot of ground and is up only 4.4% for the year to June 22. This performance places it better than only Brazil among the five countries included in the MSCI Emerging Markets Latin America Index. The iShares MSCI Brazil Capped ETF (EWZ) is nearly flat for the year. 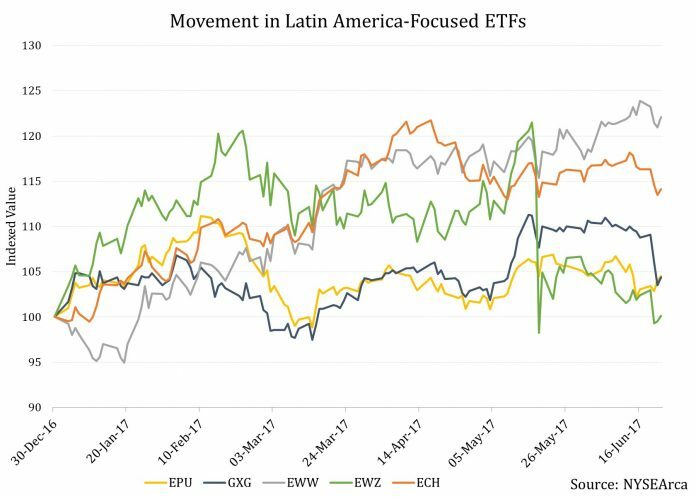 Its performance has driven down the entire EM Latin America Index as it forms a mammoth 55.5% of the exposure of the Index. Meanwhile, Peru forms only 2.9% – the smallest allocation of the five countries. 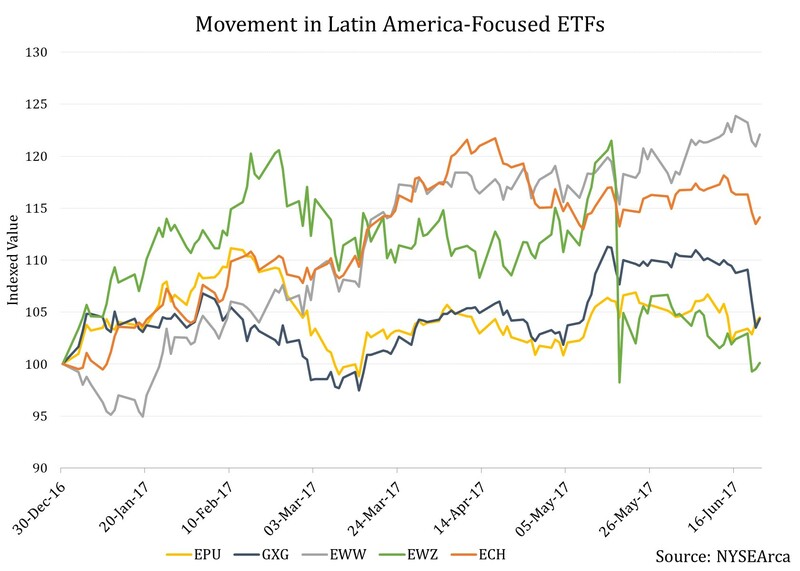 The EPU is neck-and neck with the Global X MSCI Colombia ETF (GXG) and far behind the iShares MSCI Chile Capped ETF (ECH) and the iShares MSCI Mexico Capped ETF (EWW). Industrials is the sector which has hurt the fund the most so far in 2017. Of the two holdings from the sector, engineering and construction major Graña y Montero S.A.A. (GRAM) has been the biggest negative contributor to the fund. In terms of total returns, the stock has plummeted 54.7% in YTD 2017 (in Peruvian Sol terms). 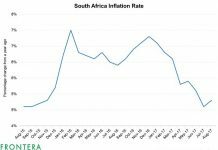 However, since it forms only approximately 2% of the fund, the impact has been somewhat contained. The second biggest negative contributor comes from the consumer staples sector. 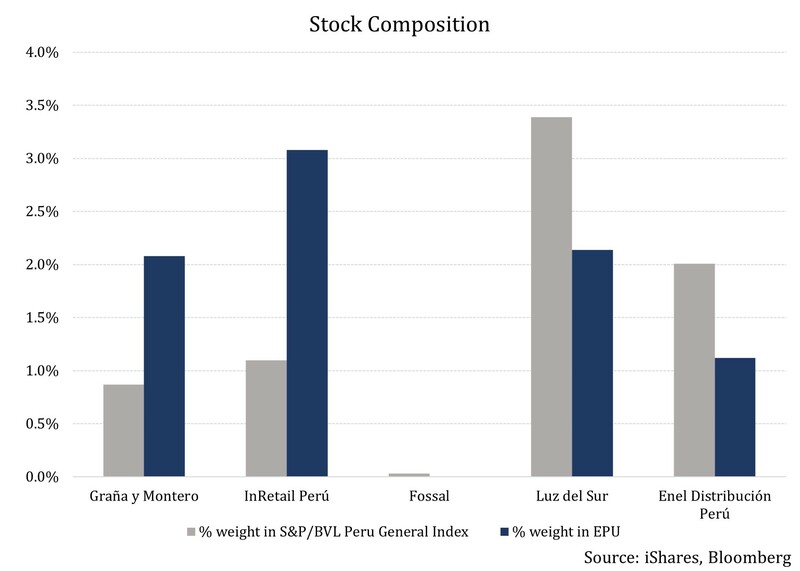 Multi-format retailer InRetail Perú Corp is one of the three holdings from the sector in the EPU and forms 3.1% of the fund. The stock is down 8.8% on the year, and has dragged down the positive contribution by the top holding from the sector – Alicorp S.A.A. The third worst performer in 2017 so far comes from the materials sector. FOSSAL S.A.A. 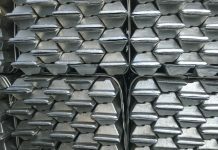 is a spin-off from cement-maker Cementos Pacasmayo S.A.A. (CPAC). The stock is no longer part of EPU’s portfolio, but its poor performance this year still makes it the third largest negative contributor to the fund. The next two poorest performing stocks come from the utilities sector. Utilities follow industrials as the second worst performing sector with both holdings – Luz del Sur S.A.A. and Enel Distribución Perú S.A.A. in that order – dragging on the fund. Let’s look at the headwinds which have held Peruvian equities back on a broader level in the next article. 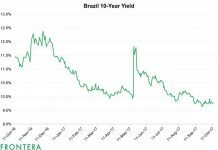 After An ‘Easy’ YTD 2017, How Will Monetary Policy Impact Bonds Latin American Countries?